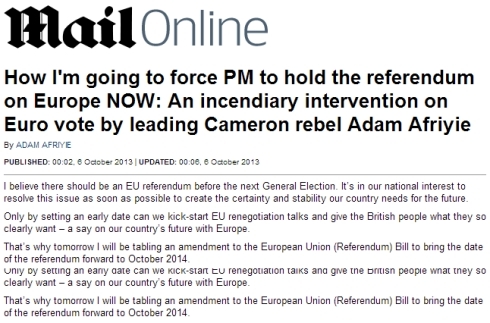 Having been derided for his aspiration of leading the Conservative Party, Adam Afriyie, has now determined how he plans to exact revenge – declaring via the Daily Mail’s RightMinds section that he will force David Cameron to hold an in-out referendum on EU membership ‘now’. This really is a new charge of a light brigade, misguided and doomed to failure. While it may elicit excitement among Eurosceptics, an early referendum would almost certainly be lost and the UK would be shackled to the twitching corpse of the EU, for decades to come or until the whole ediface comes crashing down under its own weight. The facts are these. The Eurosceptics are in appalling shape and nowhere close to ready to fighting the kind of campaign required to win public support for an ‘out’ vote. We would face a biased and distorting media where the selected voices on our side will be those who will undermine us with undecided voters and where, with the exception of the Express, even the supposed Eurosceptic press like the Mail and the Telegraph will support continued EU membership and push the false ‘renegotiation’ meme. I think people understand the argument that if you vote Conservative you will get a referendum and if you vote Labour you won’t. But we must not rely too heavily on the belief that the promise of a referendum will persuade people to vote Conservative nor trust the Labour Party not to change its position. In reality, the British people are unsure whether the Conservative leadership would be able to stick to its promise of holding a referendum after the Election, especially if in coalition once again. It seems to me that if we don’t hold the referendum before 2015, large numbers of people will continue to vote UKIP whatever happens – and if they do, there is a distinct danger that Labour will gain a majority and we will never see a referendum at all. Protest votes are understandable mid-term, but mainstream politicians continue to underestimate and dismiss the power and significance of populism – currently expressed in the form of UKIP votes. Because at the heart of a populist movement is a legitimate concern unacknowledged by the political establishment. By holding an early EU referendum, we would have recognised, embraced and addressed those concerns. An early EU referendum would resolve the issue for all political parties as well as the British people. 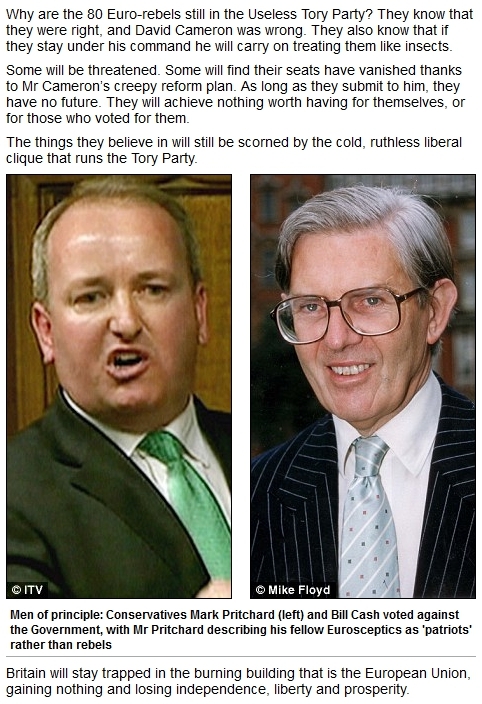 And for my party, I believe it will reunite the wider Conservative family so that we can win convincingly in 2015. That is his Afriyie’s real agenda. 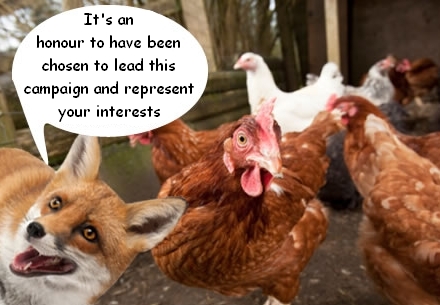 Stealing a march on Labour and neutering UKIP’s capacity for harming Conservative electoral prospects. So we now can see the only reason why Afriyie wants an early referendum. Narrow, party political advantage. The conventional wisdom is that the Conservatives would benefit regardless of the outcome of the referendum – and that is what Afriyie is trying to sell to his Tory colleagues right now ahead of tomorrow’s amendment. The national and public interest, which would be served by freeing this country from the EU, isn’t the primary consideration. That can only spell bad news for our prospects of securing our exit from the EU. Those who are currently excited by Afriyie’s construct should be careful for what they wish for. Rather than throwing compliments at Afriyie, they should be hurling brickbats. We have to suit up for a referendum campaign and be strong in order to win it. The suit has not been stitched and we are severely under our fighting weight. An early referendum is to be avoided. For the last couple of days it has been my intention to close this blog, following my annoyance and despair at the extent of support for the reprehensible Godfrey Bloom; and the continuing ill informed and factually inaccurate assertions made by people in the comments, who nominally share my determination to extract the UK from the EU. For now, while I consider whether there is any value in carrying on with the blog, there is one important issue that should be brought to wider attention. Some readers may be familiar with the name Matthew Elliott. He is a Conservative strategist, the co-founder and former Chief Executive of the TaxPayers Alliance, founder of Big Brother Watch and he led the No to AV campaign that saw the Lib Dem effort to force the alternative vote system defeated in a low turnout referendum alongside other elections. Tory Eurosceptics will challenge David Cameron to toughen his line on renegotiations with Brussels by calling for the UK to pull out of the single market altogether. Up to 100 MPs are expected to back a tough manifesto to be released in November by a new pressure group called Business For Britain. 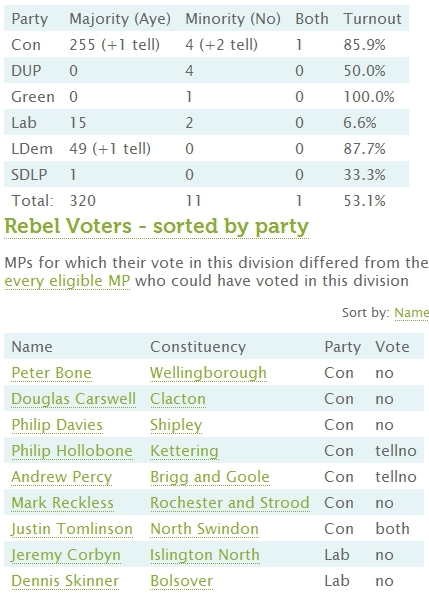 The group is run by leading Tory strategist Matthew Elliott, who ran the No To AV campaign against Lib Dem proposals for electoral reform in 2011 and is widely expected to take the helm of a No campaign in an in-out referendum promised by Mr Cameron for 2017. The interesting – and concerning – bit here is the last paragraph and the assertion that Elliott is widely expected to lead the ‘No’ (or Out if you prefer) campaign in a prospective EU Referendum. BUSINESS for New Europe’s manifesto – A Europe That Works – is a useful contribution to the debate on Britain’s membership of the EU, a debate that has often been dominated by political, rather than business voices. But the assumption that the UK’s wealth and job creators would seek to preserve Britain’s place in the EU at all costs has already been dispelled with the launch of our own campaign – Business for Britain – supported by over 750 business leaders, and calling for a fundamental renegotiation of Britain’s EU membership. How could Matthew Elliott lead a ‘No’ campaign for people who want to leave the EU, when his latest venture is an organisation making arguments only for reform of the EU, not withdrawal from it? Elliott is a favourite son of the Conservative Party, which wants to re-pay him for helping defeat the Lib Dem AV campaign, The Conservative Party is an entity that describes itself as Eurosceptic but aggressively fights any suggestion that UK should leave the EU, instead they believe it should be reformed from the inside. A state of affairs that leaves Brussels as this country’s supreme government. So it stands to reason that Elliott is being tipped for the role of leading a ‘No’ campaign, because the Tories know he favours reform, not withdrawal. Any effort to install Elliott as the ‘No’ campaign leader would be a cynical effort to steal a referendum. No football team would turn up to a match and name one of the opposing team’s players as its captain and put him in goal. Putting Elliott in charge of a ‘No’ campaign would be no different to that folly. Regardless of his campaigning credentials, no Eurosceptic should be fooled into accepting Elliott as the leader of a ‘No’ campaign. The Electoral Commission must not be allowed to hand control of the ‘No’ / ‘Out’ campaign to a Europlastic who wants to stay firm in the EU. It would be nice to see UKIP, the UK’s only national political party that advocates withdrawal from the EU, speaking out on this important issue. Naturally the followers of the Farage cult will complain they would if only the media would take notice of them. Well, it doesn’t seem like Farage has any trouble getting the ear of the Guardian’s editorial team and they do have a website on which such messages – if they actually existed – could be shared. Remember how the likes of Cameron, Clegg and Miliband keep prattling on about a strong and independent UK within the European Union? The extent of that strength and independence is shown up for what it is today in the story about a desire to extend a scheme that grants certain rural areas a discount in the amount of fuel duty they pay. 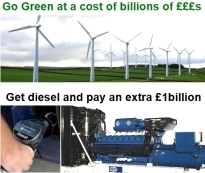 The scheme is designed to offset the additional expense of getting fuel to remote areas with a smaller customer base, so the total paid per litre is not too much more expensive than elsewhere in the country. So independent is the UK, the government does not have the right to extend the scheme to other rural areas. Instead it must ask permission from the European Commission. Despite this being an exclusively domestic matter, the people elect by those who see any point in voting do not have the power to do this without permission from foreign politicians and bureaucrats. That power was given away, without our consent, by the same political class that now has to go cap in hand to Brussels in humiliating fashion asking to be allowed to do something within our own borders. If Norway, Switzerland, Liechtenstein or Iceland want to reduce the duty on fuel, they can just do it through their own structures. They don’t need anyone else’s permission. These four countries are independent and work in their own interests. They are also part of the single market through their membership of the European Free Trade Association (EFTA), enabling goods and services to flow in and out of their countries without being hindered by the constraints of the EU customs union. This subject is a superb illustration of what the campaign to leave the EU is all about. It is about throwing off the political control Brussels has over this country. It has nothing to do with trade, or employment that is underpinned by it. David Cameron and his pro-EU sockpuppets at Open Europe, the CBI and Roland Rudd’s PR business, don’t want voters to understand the difference between the political EU and being part of the European Economic Area (EEA). Leaving the EU and its political control does not mean we have to give up access to the single market and economic benefits that can be realised. There is an alternative, a stepping stone if you will, provided by joining EFTA. What’s that you say? EFTA countries have no say over EU laws but have to implement them anyway? You heard David Cameron, Concrete Willy Hague, Open Europe, the CBI and even Norway’s foreign minister say so? Think again. The reality is very different. The political class all want to be part of a political union that voters oppose. So to stop us rocking the boat and preventing them from serving their own selfish interests, they have lied about the reality while their media hangers on have doggedly refused to expose the dishonesty. Unless voters can be reassured that withdrawal from the EU will not cause economic harm, they could very well opt to remain in the European Union. That simple yet powerful sentence, written by Richard, is almost certainly the reason why YouGov’s latest opinion poll – reported in the Wail – is showing that voters who were in favour of securing this country’s independence are starting to to get nervous and thinking instead that staying in the EU is the only way of preserving our economic interests through access to the single market. Most people don’t know the ins and outs, but the pro-EU campaign’s claims that exit from the EU would harm this country’s economy sounds plausible enough to warrant a change of heart. And the fact of the matter is these plausible claims – which deliberately spin only a slanted and easily rebutted version of the story – are not being countered by the supposed ‘leaders’ of the loose collection of EUsceptic organisations. This is the direct consequence of the absolute refusal of certain EUsceptics to consider any means of exit from the EU other than the ‘magic wand’ option – repealing the European Communities Act, thereby precipitating an abrogation of the EU Treaties with no alternatives in place. Farage and Co continue to play their fiddle while Rome burns our cash and helps decide the laws British people have to abide by. This is why, despite the UKIP brickbats that inevitably come in my direction when I make this argument, I say that faith in Nigel Farage is completely misplaced. He will destroy our efforts. Unless people understand and recognise this, we are heading for defeat. The absence of strategy and detail, that reassures voters and businessmen alike that leaving the EU doesn’t mean giving up involvement in the single market, is giving the EUphiles the opportunity to swing the argument in their favour. With the exception of a small band of bloggers trying to make a noise from the cheap seats, they have the stage to themselves. It defies belief. 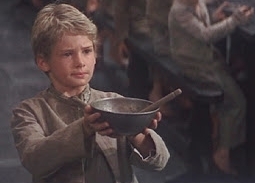 So it is that despite people citing a multitude of essential reasons for the UK getting out of the EU, for many of them the thought of losing the ability to sell our goods and services and the subsequent impact of that on jobs and the economy, outweighs the absence of democracy, self determination and the huge sums of money we are compelled to send to Brussels. Against this backdrop we have the celebrated and high profile EUsceptics absolutely nowhere in the debate and on the verge of consigning the UK to membership of this rancid union for generations to come. It would be easy to say I feel despair about all this but it’s not despair, it’s frustration and anger. The French President, Francois Hollande, declared that Europe is not “a la carte” like a menu from which member states can pick and choose their powers. He issued his rebuke to the Prime Minister as Mr Cameron insisted he would fight for a “better deal for Britain” and seek to take back certain powers from Europe. The idea of a pick and mix EU is a non starter and now we have not just an EU bureaucrat offering that assessment anonymously, we now have a head of state of a major EU member doing so. The commitment of EU member states is to ever closer union, but Cameron’s non-existant fairtytale option of taking some powers back but leaving other areas under EU control flies in the face of that. The option is simply not on the table and the EU knows allowing it would result in the unpicking of the acquis communautaire. 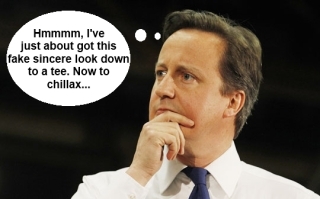 Cameron and the Europlastics need to understand EU membership is a binary condition. You’re fully in or you’re completely out. Just as a woman can’t be a little bit pregnant, a country can’t be a little bit of an EU member – even though both conditions originate from having been screwed. The drawbacks of membership and increasing recognition of the loss of self determination in this country are strongly outweighing the retailed positives, resulting in a growing number of Britons saying they would like to leave the union. The number will only increase as more people come to recognise Cameron and the Tories have been telling tall tales, and that recognition will dawn as more interventions from the likes of Hollande are publicised. That means there will eventually be a showdown and the battle will be the in-out question. It’s not a question of if, Hollande has seen to that. It’s now a matter of when. The EUsceptics will need to be on their game to defeat the wreckers of the Tory Europlastic tendancy. Yawn. Once again we are subjected to spectacle of the media getting moist about what it perceives as a major political story. The Sunday Failygraph gives space to the Vacuous Unprincipled Cameron (Vuc) to waffle inanely with meaningless verbiage, leading to the BBC and others diving in to paint this as Vuc the Europlastic paving the way for a referendum on EU membership. But as always you have to ignore the sub editor’s hype and instead read the words on the page. When one does so, one will find nothing has changed. I am not against referendums in our parliamentary democracy. Parliament is elected to make decisions and be accountable, but when powers are transferred it is right to ask the people. It is enough to make one lose the will to live. From the moment Vuc the Europlastic slithered into Downing Street the government he leads has transferred a raft of powers to the EU – even quicker than the Europhile Labour administration – and the people have not been asked once if they approve. We have a Prime Minister who resides in a realm of fantasy where he waxes lyrical about power transfer and referendum locks, in spite of the evidence. Having openly declared his firm Europhile position, our ‘practical Eurosceptic’ / ‘instinctive Eurosceptic’ / arch Europlastic continues his voyage of delusion with talk of our supposed ‘relationship’ with the EU. We do not have a relationship with the EU. It would be nice if we did for that would signal that we are not part of it. It is not possible to have a relationship with something of which you are constituent part. But his ludicrous assertion continues to be treated by the media as an uncontestable truth and Vuc is allowed to get away with this blatant deception. Nevertheless I will continue to work for a different, more flexible and less onerous position for Britain within the EU. How do we take the British people with us on this difficult and complicated journey? How do we avoid the wrong paths of either accepting the status quo meekly or giving up altogether and preparing to leave? It will undoubtedly be hard, but taking the right path in politics often is. As we get closer to the end point, we will need to consider how best to get the full-hearted support of the British people whether it is in a general election or in a referendum. As I have said, for me the two words “Europe” and “referendum” can go together, particularly if we really are proposing a change in how our country is governed, but let us get the people a real choice first. Richard North over at EU Referendum has on more than one occasion patiently dissected and deconstructed the notion of Britain being able to engineer for itself a different position within the EU to other member states in the way Vuc puts forward. That Vuc continues to spout such idiotic nonsense confirms that he is either a determined liar, or an incompetent with no understanding of how the EU and its mechanisms work. Either way, he is deceiving the British people. But while he may be deceitful he is surrounded by advisers and influencers who are capable and cunning. Hence the deliberately vague language about how people might be given an opportunity to signal their wishes in respect of the EU. But note, he has already made clear an in/out referendum is not to be put to the people. So a binding democratic decision by the electorate about EU membership is a non starter and in the unlikely event there is any form of referendum, it will be based on a fallacy and will ask the people if they want to have a different relationship with the EU – which is virtual impossibility. Nevertheless, we will hear for days fevered speculation from the talking heads in the Westminster bubble about the shape and timing of a referendum that still has not been commited to and even if it did come to pass is even less likely to ask the question people want to answer. There is a body of opinion in Scotland that wishes for that country to leave the United Kingdom and become a fully independent nation state, embodied by the Scottish National Party (SNP). With the SNP having beaten Labour to form the devolved government in Holyrood, the notion of a referendum on Scottish independence has ceased to become a moot point and has become a genuine prospect. As a result the independence issue in Scotland seems to be coming to life. There is a feeling that as Scots have become used to their SNP devolved administration they are increasingly warming to the idea of full independence – or enhanced devolution at the very least. Polls last year by YouGov and Ipsos-MORI showed a majority of Scots voters still opposed to independence, although support for independence was shown to be increasing. In between those two polls, however, Scotland’s Herald newspaper commissioned a poll by TNS-BMRB that saw more respondants in favour of independence than against it. 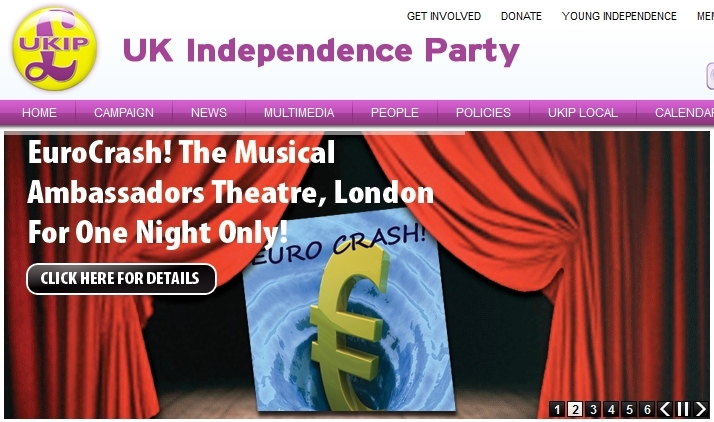 Momentum is clearly with the pro-independence argument and it seems to be building. We have long been subjected to the sight of the main three political parties uniting under a ‘consensus’ banner to oppose any idea that doesn’t suit their wishes. The same thing is happening in respect of the issue of a Scottish independence referendum. The main three parties want to lead a government of the United Kingdom (setting aside the EU elephant in the room). The idea of English, Welsh or Northern Irish MPs running a government that does not encompass rule over Scotland doesn’t fit with their delusion of power. What the Scottish people may want is neither here nor there, which is why Westminster is holding on tight to its legal authority over binding independence referenda by countries that form the United Kingdom. And therein lies the problem. That is why we are seeing non Scots holding forth in front of the media saying what the Scots can and can’t do, must and mustn’t do. Polling data shows the desire for independence is growing, therefore the Tories, Labour and Lib Dems are now pressing hard for a referendum in Scotland to be held sooner rather than later. The aim is clear – force the SNP to hold the referendum now before momentum builds and more people swap to the independence side. Understandably the SNP wants to wait until it thinks enough Scots will vote for independence. The resulting bunfight is now in full swing. The only people who should decide the future of Scotland are the Scots. The only people who should decide the timing of the referendum in Scotland and the question(s) asked of the Scottish people are the Scots. The Scots must be freed of the constraints imposed by Westminster and allowed to decide their future for themselves. We are now witnessing hypocrisy writ large. There are people who expressed outrage that Ireland’s Lisbon Treaty referendum was subject to heavy interference by the EU, but who are endorsing similar interference by the UK in Scotland’s independence debate. The Scots must be free from interference to organise themselves, reap their own rewards and make their own mistakes. The same must hold true for the English, Welsh and Northern Irish. That is what democracy and self determination entail. Never mind the irony that they might secure for themselves independent nation status only to surrender it to governance by the anti democratic European Union, or help bring about the EU’s regionalisation agenda. Never mind that they may have misplaced assumptions about North Sea oil ownership and revenues. Never mind the complex issues around fiscal and military (to name but two hugely important matters) separation from the UK. The Scots must decide for themselves – and they must do so on their terms and at a time of their choosing. A reader has tipped me to yet another e-petition demanding a referendum on EU membership. We must play the politicians at their own game! When the French, Dutch and Irish voted No to the EU constitutional and Lisbon Treaties, they were asked to vote again. We must force our MPs to do the same. There are loads of other petitions but they are too similar to the one that was granted a debate so therefore will be rejected by the committee responsible. We have spoken to the petiton office! Our new petition, it is worded differently so the EU can be re-debated due to a clause in the programme for Government, that the people will be able to table their own bill. Like what happened in other European Counties let’s keep having them vote until we get the ”right” result!! We have spoken to the petiton office and they have indicated that they would allow ours! Somehow I cannot see the Parliamentary Committee giving this the time of the day, given that it focuses on Article 50 of the Lisbon Treaty instead of offering the Europhiles’ faux option of ‘renegotiation’. 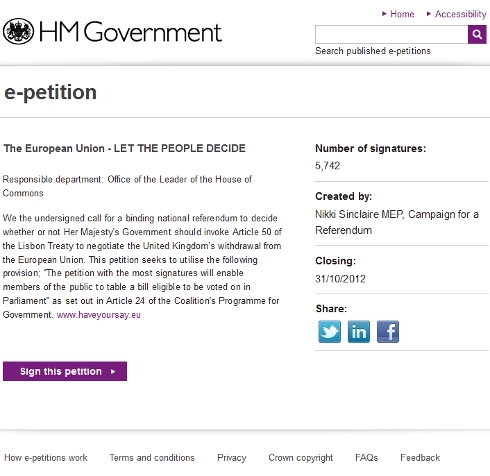 But it will be fun to see what happens if this tops 100,000 signatures and forces the Committee to consider it. If nothing else it would again demonstrate the overwhelming majority of MPs put their own interests before their duty to fulfill the wishes of the people they supposedly represent. It would also sort out the Eurosceptics from the Europlastics. These days one never can tell how much of what is published in a newspaper comprises the complete original thoughts of the columnist. In the last few weeks I have seen the original drafts of a renowned Telegraph columnist and a Daily Express columnist, and on both occasions the published piece has been edited down to remove some of the most salient elements of the respective pieces. How is it that someone like Peter Hitchens, who is supposed to be a genuine Eurosceptic, can sit at his keyboard and write something this misleading? How can the likes of Bill Cash be described as a man of principle when the European Scrutiny Committee, which he chairs, waved through the EU’s Integrated Maritime Policy which will remove British control over our own waters? How also can Hitchens allow people to take the impression that all the 79 Tory MPs who voted in favour of a Bill to hold a referendum are actually Eurosceptic? How could any Eurosceptic Tory vote in favour of establishing the European External Action Service (EU’s version of the Foreign Office)? Based on what Hitchens is saying then surely around 79 Tories will have voted against the EEAS measure. How many actually did? See for yourself. Looking at the vote information above, where are all these ‘Eurosceptics’ that Hitchens refers to? It seems even those who profess to stand outside the bubble still manage to sow the official misinformation that positions Tory MPs who wish to remain firmly inside the EU as sceptics. One cannot be Eurosceptic and vote for increased integration, something that someone like Hitchens should know all to well but fails to make clear to his readers. When looking at conflicts throughout history you can see a pattern of behaviour that was common to retreating armies. They would burn anything of use, partly to deny anything of use to their enemy and partly to punish those who watched them flee in ignoble fashion. They would also, as a matter of course, throw dead bodies and waste matter into the water supply to deny those who are chasing them away access to that which is essential for survival. It is known as poisoning the well. With the increase in support for those who argue Britain should leave the EU, we are witnessing the Europlastics performing the political equivalent of poisoning the well as they retreat. 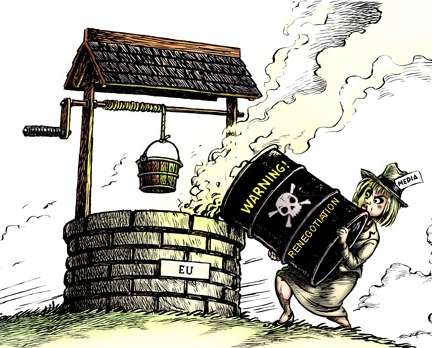 Instead of throwing dead bodies and filth into the well, they are throwing the toxic, fairytale ‘option’ of renegotiating the terms of EU membership into the debate to poison it. This is the way in which they will perpetrate their next great con on the British public, by persuading them to vote for an impossible option, thus ensuring that the debate is killed stone dead and Britain stays firmly inside the corrupt and anti democratic EU. Renegotiation is not an option. It is not permissible. Its very presence in the debate is a deliberate and cynical deception. It is the poison in the well. The Europlastics and their useful idiots in the media are focusing all their energies and column inches on renegotiation being what the majority of voters really want, not withdrawal. For the EEC referendum deception in 1975 read the national referendum on EU membership debate in 2011. The public was conned about the EEC being nothing more than a free trade area then; the public is being conned that renegotiation of EU membership can be conducted now. Lies characterised the pro-EEC argument in 1975, and they resulted in the situation in which we find ourselves today. 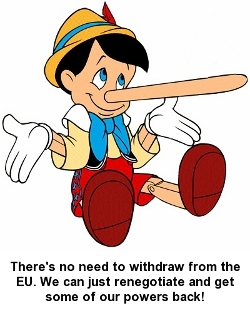 Lies are characterising the renegotiation argument today, and if allowed to continue they will result in Britain being permanently bound as a province of the European Union. 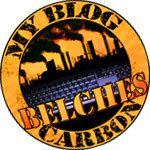 It is time to defend the well and counter the Europlastic lies. In a superbly thought through blog post, Witterings from Witney has turned his attention to Monday’s debate on a Motion relating to the holding of a national referendum on the UK’s membership of the EU. As WfW rightly points out, the European Union’s process of acquis communautaire means that once the EU assumes competence over any area of government it cannot be returned to member states while that nation remains a member, so the prospect of renegotiating EU governance over the UK and repatriating powers and remaining a member of the EU is a pipe dream. The degree of public ignorance about what is and isn’t possible as an EU member confirms this country’s population is not anywhere close to being able to make an informed choice if presented with In/Out/Renegotiate options. The calls for a referendum by enthusiastic Eurosceptics risk being seized upon by the Europlastics as an opportunity to spike the issue for decades by offering a false choice that could never be carried out, and using that vote outcome as the basis for maintaining the status quo. Most of the media has no interest in explaining to people the reality of the situation – and the politicians certainly don’t. This country’s people must have their say about how this country is governed, but it must be an informed choice. That is not possible at this time. Update: Richard North asks Eurosceptics one simple question over on EU Referendum – Still think you would win?